In a war-torn, forgotten remnant of the Soviet Union a battered laboratory stands, housing the remnants of twisted experiments. Some of the surviving tenants — part of an attempt by the insane veterinary doctor Ilya Ivanovich Ivanov to breed a slave race of ape/human hybrids — have escaped into the surrounding forest, their whereabouts unknown. We're not making this up; this is happening right now at the crumbling Research Institute of Experimental Pathology and Therapy in Sukhumi, Abkhazia, a small nation-state on the Black Sea. Now long gone, Ivanov was the star of the Institute in the early part of the 20th century —- he made his name cross-breeding zebras with donkeys, antelopes with cows, rabbits with guinea pigs, and so on. By the 1920's it was in his head to try humans and monkeys. He drummed up Soviet and private funding and repeatedly tried to inseminate Chimpanzees with human sperm before he reversed the process and tried to impregnate at least one human female. The Institute became his base of operations before he was caught up in a Stalinist purge and exiled to Kazakhstan, where he died in the 1932. 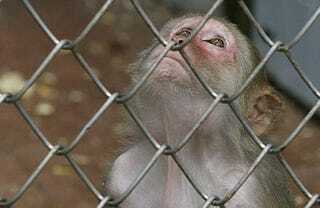 Today several hundred monkeys live on in dilapidated cages at the Institute, and some have escaped into the surrounding forests, where townspeople routinely spot them. Ivanov's attempts at breeding a hybrid primate race are all said to have failed, though, and genetic differences between chimps (our closest genetic relatives) and humans make it unlikely that humanzees are even possible. Still, evidence suggests that our human ancestors were getting busy with chimps even after our two lineages first split. And there's always Oliver.